I got my start in metalsmithing with a work study job as a blacksmith at the University of Oregon. I was to, among other things, make tools for the jewelry studio, especially various punches. All things cycle back around, and I am once again making tools, though the tools I made back then look rather crude, when compared with those I am selling now. 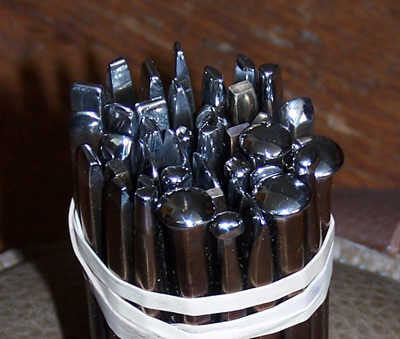 This is a batch of punch tools that has been hardened, but not yet tempered. The black firescale will be removed and the tools heated until they no longer are brittle. I don’t make these often, but I sometimes have a few Carnelian Burnishers, with walnut handles left, and wanted to let folks know that they are available. I’m selling them for $40 each. If you are interested let me know, just go to the contact and ordering page. Thanks so much. I hope to have more before too long. In Japan goldsmiths make most of their own punch tools gravers and chisels from this sort of preshaped tool blank. I make these tegane blanks in the traditional way, forging them by hand, one at a time in a charcoal fire. Both ends taper so that the point of hammer contact is aligned with the working tip. They are annealed and treated with camellia oil, so the tips may be shaped directly with a file before hardening, or heated and hammered to shape. Heat treating is simple, just quench in water, and temper to whatever hardness in required. 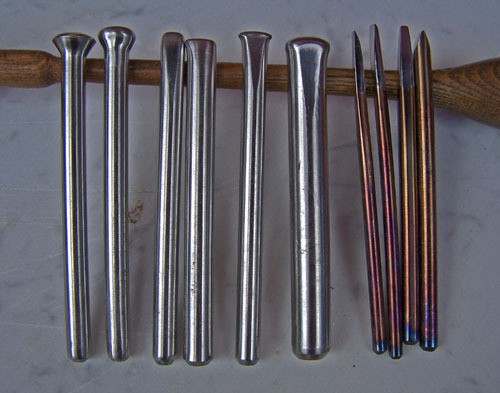 After heat treating the tips may be polished or honed to the final shape and finish. 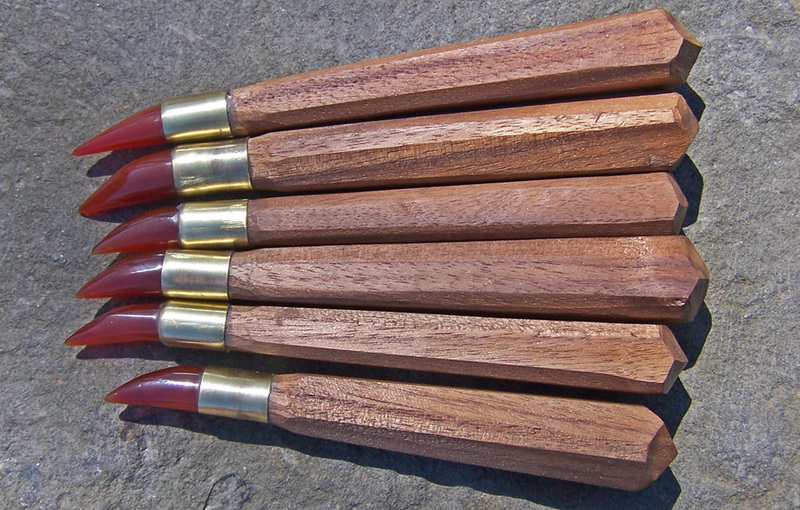 You can find them for sale below with both square tips and rectangular tips, each in large medium and small sizes. Small-$6. Medium-$8. Large-$10. Ask about discounts for large purchases. All manner of small cutting marking and shaping tools may be made from these blanks. Those pictured above are mainly for inlay carving and engraving work. 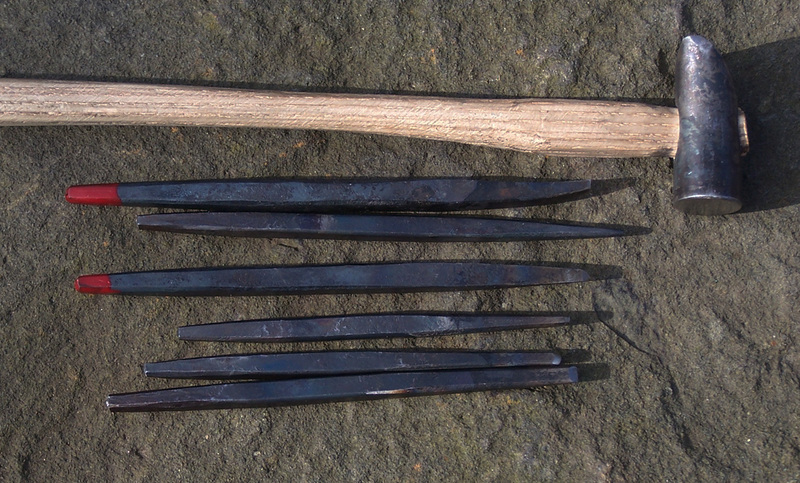 These sets include 6 rather large repoussé punches, one liner, and 3 undercutting punches, all designed especially for the techniques Megan teaches in her Chasing and Repoussé workshops. The liner and undercutting tools are heat treated and tempered, and the working ends have been polished. The repoussé punches are work-hardened and ground to a satin finish to better grip the metal. They can, if desired, be polished, heat treated or both. Cost: $250 per set of 10. Below are some of the chasing tools I have available for sale. If there are tools you would like that you do not see here, contact me about whether I have such a tool for sale, or to make a custom order. I will be posting more tool patterns as I get them photographed. All the punch tools in this section are made from W1 tool steel, which has been hardened and tempered before finishing. The hammer end has been softened so as not to mark the hammer face. They are about 4” long, by 1/4” wide, and most are roughly octagonal in cross section. 222 Photo to be posted soon.